From what Ethiopia experienced in the past 12 months, it is evident ethnic politics has become an existential threat. Now government admitted it officially that it constitutes national security risk. Amid countrywide protest in the months before Abiy Ahmed became Prime Minister of Ethiopia, the ruling coalition, Ethiopian Peoples Revolutionary Democratic Front (EPRDF), was in the business of critical self-evaluation. And one of the things that members of the coalition agreed was that the rights of nations and nationalities were implemented in a way to undermine the collective identity and national identity. Consequently, and as a way out from the problem, the party decided to work on fostering shared national identity. However, the decision appeared rather late. In the ensuing months after Abiy Ahmed took office as prime minister, ethnic-based violence became pervasive phenomena in different parts of the country claiming dozens and dozens of lives and displacing millions of people. Ethiopia has now well over 2 million internally displaced citizens. On Friday, April 5, 2019, the Ethiopian government officially admitted that ethnic politics has now turned out to be the major National Security risk for Ethiopia. In a Press Conference organized in the Office of the Prime Minister, National Security Adviser Minister, Temesgen Tiruneh, explicitly stated that ethnic politics has become a major security concern. “As we all know, the major concern which is also the causes of violence in different parts of the country is ethnic politics,” he said when Voice of America Amharic service journalist, Eskinder Firew, asked him as to what constitutes the major national security concern for Ethiopia. Even individual conflict could escalate to an ethnic-based one, he added. Before Abiy Ahmed’s administration, Shabiya (a reference used to denote Eritrean government), Al-Shabab, Ogaden National Liberation Front (ONLF) and Oromo Liberation Front (OLF) were considered threats to national security. All these organizations, however, except Al-Shabab, were removed from the list of terrorists. All those rebel forces returned to the country for a peaceful struggle after what looked like a ceremonial negotiation with the new government of Abiy Ahmed. The Ethiopian government has openly admitted, in recent weeks that maintaining rule of law and protecting the safety of citizens has become a major challenge. But the fact that the problem has a lot to do with radicalized ethnic politics was overlooked. Now, the government seems to face reality. The mobility of citizens, for work or otherwise, from one part of the country to the other is now causing a safety concern. Besides, Ethiopians who have been living for ages in the part of Ethiopia to which they do not belong ethnically are becoming targets of ethnic-based attacks. There was even a situation where ethnically based regional states overtly facilitated such attacks, as in the case of Ethio-Somali region, against other Ethiopians – which triggered a military response from the Federal government leading to the arrest of the head of the regional state in late August 2018. In Oromo and Benishangul regions, ethnic-based attacks and displacement have become a recurrent problem. In Guji, Oromo region of Ethiopia, nearly a million ethnic Gedeos were displaced, and many seem to think that it is a sort of ethnic cleansing effort. In Amhara region, violence between Amhara and Qimant community in Gonder region caused dozens of deaths and displacement of well over 40,000 people. The sentiment for ethnic violence is still there. Activists with a conviction of unstated radical ethno-nationalism with huge followings on social media could cause a lot of damage to the country. Some of them seem to be more or at least as influential as government officials including Prime Minister Abiy Ahmed which is why, apparently, the government has been fearful to hold them legally accountable and reduce their influence through administrative measures. In consequence, ethnic-tension in the country is taking root so much so that now the government is considering it as a national security concern. 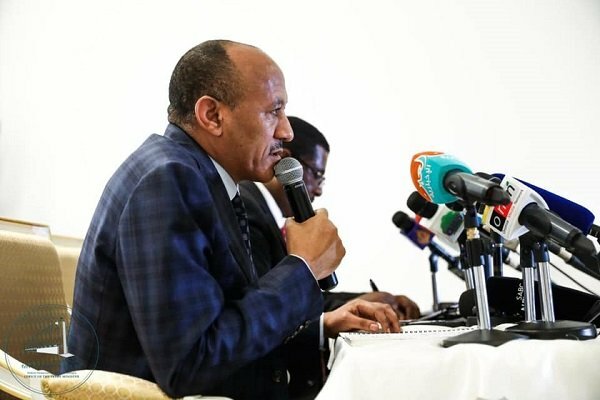 “We have to create a system where every single citizen can live in peace and live in dignity,” said the national security advisor the Prime Minister, Temesgen Tiruneh. Yet, he admits that tackling the threat that ethnic politics posed to the nation requires extensive work and a political solution. Prime Minister Abiy Ahmed has been roving Ethiopian cities preaching “love” but no major policy response is introduced as yet except that his government has established a ministry of peace – which seem to be dealing with the effects of ethnic politics rather than dealing with the cause of the problem. Even the approach to deal with by-products of ethnic-politics is divorced from strong desire and commitment to ensure the rule of law as it is focusing the same approach that the prime minister is pursuing; preaching love and unity. 8 Responses to "Ethiopia admits ethnic politics constitute greatest national security risk"
To admit this problem is a good start. Next steps should be to reorganize the nation on a non-ethnic based federalism. I don’t even think there are a lot of people who would proudly hold the current flag with the blue star. That’s because it was imposed by Woyanne instead of peoples will. We are evaluating the benefits of abolishing the Ethnic Federalism system and creating one huge district in Ethiopia. So far the research shows that It can be done, all that is needed to make Ethiopia a one state country is mutual respect. If we take the example of California, USA where close to.45 million people with diverse ethnicities and cultures living under one administration then we can also tear down the regional boarders and make Ethiopia a one big state only country.We do not need fourteen different districts when Ethiopia can be all under one district or under one state with just municipalities under it. A well written article. Regarding the approach of “preaching love and unity,” it is an effective solution, albeit a longer term one. Don’t forget how the seed for the ethnic based hatred was planted by tplf from the start. Unless one gives up on the country, it makes sense to work on longer term and long lasting solutions. It is likely the government is trying sort term solutions as well, some or even most of which might not have been effective enough. It’s a difficult problem, and it’s not reasonable to expect the government to wave a magic wand and make the problem go away overnight. We should all do what we can to help find solutions while criticizing the government for its failures. PM Abiy and his team should practice fairness and equal justice for all.Some are being targeted wrongly while others are left to break laws. The hate speech that is being directed against me personally and my tribe should be stopped right now. Just because Nazrawi Abera is in jail in China, it doesn’t mean either she nor me are involved in any drug smuggling operation. Even if I was involved I should be punished personally not my whole tribe should be defamed. We are both innocent until proven guilty, so I apologize to those family members of mine and tribal members of mine that suffered any generalized assumption categorization of illegal action due to my ethnic affiliation.The government should make sure to confront those that are sending any defaming gestures during this time of grieving I am going through due to the loss in my family and the worry about the imprisonment of my dear friend Nazrawi Abera. Let it be clear to all, for the last decades or so we Tigraians wanted to give our time and energy to develop and defend Ethiopia. We donot want to anymore. We did a good job developing and defending the country since 1991, then Ethiopians got greedy and started fighting over who receives development first. We told them to be patient and work with us but Amara Oromo didn’t want to work but wanted to protest. So we distanced ourselves from Amara and Oromo. Now I guess they are asking each other who chased Tigraians . The answer is noone chased us, we just distanced ourselves by choice. We Distanced ourselves by choice because Amara Oromo disgusted us . EFFORT CONTROLS FIFTY PERCENT OF Ethiopian economy. Meaning if we Tigraians want to, we Tigraians can afford to live like Libyans. We can afford to live anywhere in the country with safety while our money works for us. We donot even need to work if we choose to, we can just sit at home while our money work for us and we can live a better quality of life more than the rest of Ethiopians do.For the past decades We asked Ethiopians to work with us but they said “no no” With protests everywhere so now we Tigraians are going to let our money work for us, while as we see it they protest again and again barely surviving with conflicts allover while we are in peace.Even the military is unable to perform it’s,s duties and the foreign debt is sky rocketing. Today Basically we Tigraians are like foreign investors, collecting our income through EFFORT , we can watch the working class the 80% Ethiopians Amaras and Oromos start working while we rest from the hard work we have done since 1991. Tigraians should know that each of us own a share of EFFORT meaning money should not worry us anymore, it is time for Tigraians to return home and rest. Dear Hermela, EFFORT has very few shareholders. TPLF wants us to think we are all shareholders. The truth is that unless you are related to the fewer than 10 shareholders of EFFORT, you are mistaken to think you are a shareholder. Also, most of EFFORT’s investments are tied down in Addis Ababa. It has lost a lot of and will continue to lose a lot of its value. TPLF never looked out for us. They just use us to fulfill their own personal agenda. The sooner the better!! If we do not stop this evil, ethnic politics (racism) soon, it will be claiming millions of lives; it might even endanger the very existence of this country. Nobody can show us ethnic politics in the Ethiopian form has succeeded in the world. All countries which started ethnic politics have failed miserably: Yugoslavia, Rwanda, South Sudan, etc. How many lives should we lose before we ban ethnic politics (racism)? Ethnic politics (racism) should be banned now before it is too late!! !